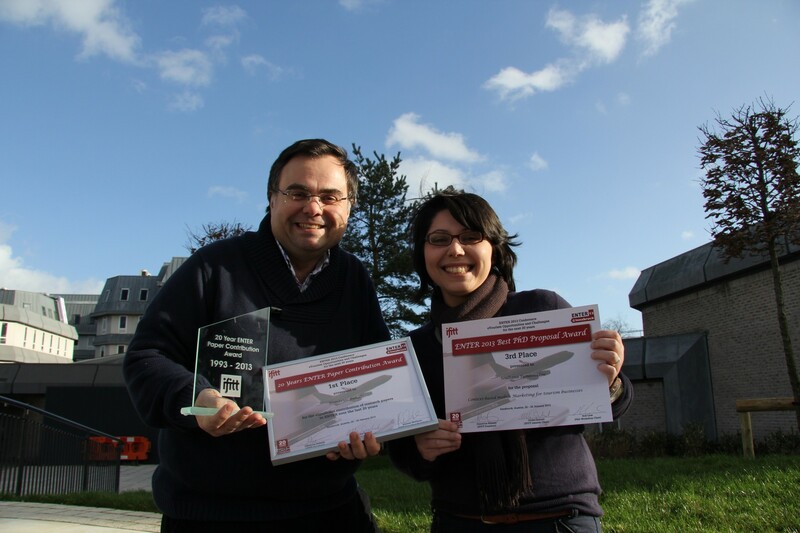 Last week, after the success of ENTER2013 @ Innsbruck, Austria Professor Dimitrios Buhalis and PhD student Soultana Symeonidou were both awarded separate awards from the conference committee. Dimitrios was awarded the “20 Years ENTER Paper Contribution” 1st Place and Soultana won the “Best PhD Proposal Award” 3rd Place. Enter 2013 ran from Tuesday 22nd – Friday 25th and celebrated 20 years of continuing contribution and ground breaking interactions within the IFITT community. The ENTER conference, organised by IFITT, offers a worldwide and unique forum for attendees from academia, industry, government, and other organizations to actively exchange, share, and challenge state-of-the-art research and industrial case studies on the application of information and communication technologies to travel and tourism.